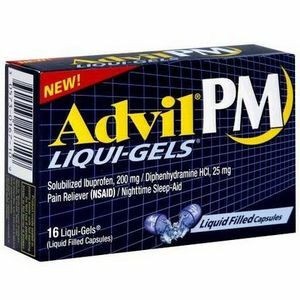 Advil PM saved the night! I hurt my back a few days ago and the samples of Advil PM from Vewpoints/PowerReviews came to my house just in time. It's really hard to sleep or move when your back hurts at night. I took Advil PM and was able to drift to sleep comfortably~ something I haven't done in 3 nights! I used Advil PM for leg cramps and sleeplessness. I found that it did help me fall asleep fast and it did relieve my leg cramps, however I did not stay asleep for more than 4 or 5 hours. I did feel rather groggy on it the next morning after the first time I tried it. Consequently I tried taking it a little earlier in the evening instead of waiting until bedtime and it helped me tremendously. I was able to get a good night sleep and I woke up pain free. I would use this as a solution to occasional pain and sleeplessness. I trust the Advil brand. Finally, a good nights sleep! Great pain relief for p.m. I Receive a free sample for a honest review and i suffer from chronic pain and arthritis and i also have problems getting to sleep and i tried Advil PM and i had a great night sleep i woke the next morning feeling positive and more energize. I also like that Advil PM had no side effects and relieve stress and pain .Advil PM is great and it was my first time trying it. It works awesome i fall asleep within 30 mints to an hour only issue i am having is always wake up in a bed mood and i end up sleeping all day. 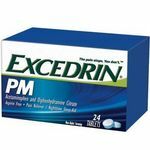 I am sure that Advil PM is a very good product,but it just isn't for me. i can't take any Advil because it makes my stomach hurt, but that is just my sensitivity. 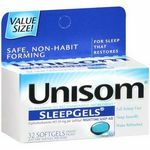 This type of product does help people got to sleep and rest, but they make me way too groggy in the morning, so it isn't anything personal against this sleep aid product. Effectiveness They are very effective as far as helping people get to sleep if they don't mind waking up real groggy, but then ti might not have the same effect on everybody. Ease of Use It is very easy to use,just take one with a glass of water and go to bed about an hour before you want to go to sleep. It might take a while to start working. Immediacy It can be a little slow at starting to work,so just relax and give it some time. It will help you sleep. Side Effects For some people it does have a few side effects,like making them feel real groggy in the morning. It does that to me as well as making my stomach hurt and feel nausea,but that is just me. It might be wonderful for others. Advil PM is my favorite nighttime relief! I have had insomnia for years. I was on Ambien when I was pregnant with my twins because I was not able to get any sleep at all. I continued to have insomnia after the babies. I did not continue with the Ambien because I did not want to be on such a heavy medication in case I needed to attend to my children. 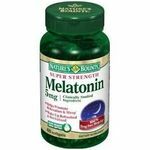 I tried several types of over the counter sleeping aides. Out of all the ones I tried, Advil PM helped me get the best rest. I also did not have a weird physical reaction. Some of the other sleeping pills made me feel jittery and on edge. Advil PM did not. However, I recommend only taking Advil PM if you are able to get at least a good solid eight hours of sleep. If not, you may feel a little out of sorts the next day. I will say it has not worked every time. There are times when I have taken two pills and have not been able to sleep at all. I just ended up being groggy the following day. 8-10 times though it works well and is the only reason while I may be able to get a night's rest. 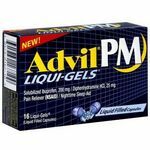 Advil PM is the sleep aid I most often use. It kicks in quickly and when I wake up about eight hours later, I don't feel "hungover". Effectiveness I always fall asleep within thirty minutes to an hour. 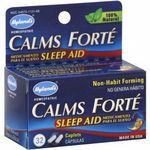 This is the most effective sleep aid out there in my opinion. Side Effects I have never had any negative side effects.